In a classic neutral shade, the Faith Brushed Chair Grey Faux Leather is a fabulously multipurpose model, which is stackable for compact storage. Not only is it a perfectly practical design, the Faith will upgrade your dining room with its simple sophistication. Its padded grey faux leather seat features a high backrest, elegantly curved to provide optimum support to the entire back and offer graceful style. Placed around a dining table, kitchen table or elsewhere, it will impart a sophisticated aesthetic thanks to its hand-brushed stainless steel legs, a muted finish that is incredibly popular in modern furniture design. Protective plugs are integrated beneath the legs to help to look after your floors, ensuring the Faith is as versatile as it is chic. 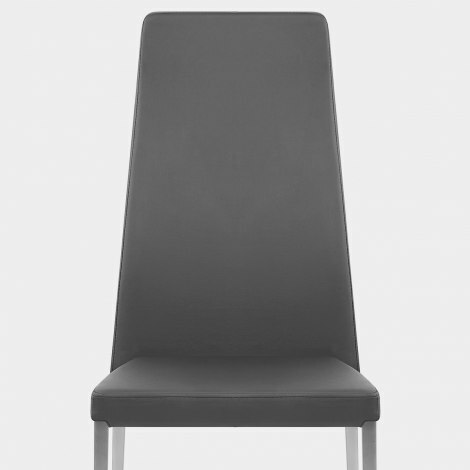 "Excellent quality chairs that are very comfortable and stylish"
Purchased 4 dining chairs and delighted with them. Great quality, sturdy and robust. Very comfortable with the high backs. Received these promptly and i am very pleased with the look and quality of them. Repeat order delivered on time again. Good product good service good price good company. What more do you need. Excellent quality chairs that are very comfortable and stylish. Would highly recommend. This is our second big purchase from Atlantic shopping (bought 4 beautiful bar stools previously) and we’ve been very impressed with the company, service, quality of products and excellent value for money.